Daniel09 wrote: I am always curious when people say they "always knew" they were a Vampire. No disrespect intended, and I don't question anyone's claim beyond the fact that I only know it's a claim, but how could one always know? Memories do not begin retaining within a human brain to allow the conscious mind to begin thinking beyond itself until a number of years into development, and then one must learn what a Vampire is in order to know they are one. There are so many definitions of Vampire out there currently and over the last fifty years that I feel it's impossible to "know" one is a Vampire their whole life. One can feel that they absorb something from others, energy, whatever, but I feel it is always a stretch to say "I always knew." I only began to come to the realization myself a couple years ago, when I was so shacked on energy that I was losing my abilities to control my instincts, biting myself to release endorphins. I had once seen the term Vampirism used to describe a blood fetish, and I was desperate to find out what was wrong with me, so I looked it up and stumbled upon the Vampire Community, which educated me in the basics of magick and control over energy and feeding. It took well over a year to recover mostly from that time period, but I did, and that's how I "knew" I was a Vampire. But I still stand by my thought that I feel no one could have "always known" they were a Vampire. It just doesn't make sense, unless your parents taught you that you were one at as young an age as they could. The likelihood of that is slim, but I do suppose it is possible. You know, I was thinking about your post yesterday and all of a sudden I remembered the exact moment that I became "awake." I was listening to 10's by Pantera, and it bam happened. Then for the 1st time a lot of things made a lot of sense to me. Even when I was little, I remember thinking weird stuff like when I get older, will I develop powers to read minds? Maybe that's what people mean...that there's always been pieces of the puzzle there, even though it was only at a certain point that it all came together. Well yeah I am going to share I choose vampire since its what I am. So what if say someone could remember the day their current body was born? And what if said person could also remember other lives. Hahahah. so fricken funny.. Nevermind...And what if said person has very few friends, because said person can never feel like they totally belong anywhere. Wow, such funny stuff here. Maybe judgements are the name of the life one leads who is born knowing, and being born knowing means anytime you open your mouth and try to express those experiences which are so strange and you realize that when others say they feel a lone, you in fact are a lone. Anyways I need to go out now.. I think I understand. I apologize for sounding close-minded and daft in that previous post. I would say that someone remembering the day they were born has nothing to do with vampirism or spiritual evolution. Memory, when it comes to current life experiences, is related with the chemistry of the brain, and varies greatly from person to person. Cannot be related with past-life experiences, which are not actually related to Memory, but with a connection to the Akashic records. So remembering the day of birth can't be put in the same bag of knowledge from previous lives. Now when we deal with past-life work, anyone can claim to have knowledge of many of them, which goes a great deal to actually knowing for real about it or having that same knowledge verified in any reliable way. And when I say verifiable I don't mean we own anything to anyone or any explanation, but first of all, we should want to have it verified for us. The old "I feel it deep inside that it is true" is not enough, unless someone does not mind to live in delusion. Having few friends? Loneliness, detachment and being anti-social can be connected with vampirism, but then again, so it can be connected with Emo-lifestyle and countless other normal people. That alone means nothing. Daniel09 wrote: I think I understand. I apologize for sounding close-minded and daft in that previous post. I'm sorry, I should not of posted earlier I was feeling kind of growly and it was bad form. I didn't vote but this is what I have to say.Even though I used to believe that I maybe a lot of things in the past, but in my heart I believe that I am Elven (in soul) which took a long time for me to realize, plus it was the last category I thought I was.Therian (wolf most likely but I don't know) is possible yet questionable because once or twice I had a mental shift but that was it.Sometimes I just assume that I am a certain type but I don't know for sure so I will not get into that.Plus after the last time I got into this discussion, a few answer that I need to go to the doctor because of what I explained about my experience that happened once (it was a Otherkin forum) This is why I don't join many otherkin forums anymore or I just don't show myself very easily because instead of guiding others maturely they assume that one has mental problems and make jokes. I didn't really "claim" I was anything in absolute. I just want to know what the hell it was because I was not the only one to had this experience.Funny thing is that I went to another fourm that has nothing to do with otherkin, someone gave me a straight forward answer (that it was a M-Shift) then the topic moved along.No blind judgment or stupid drama.Plus another member in that non otherkin fourm explained a similar experience. I guess it depends what you believe about near death experiences, because it was an experience like that which I remember. But I think I would have to write a book to explain the whole thing properly, because I remember parts of the "inbetween" that came before that part too. I didn't say that it has something to do with being a vampire it has to do with being me and I am a vampire. I do not go around just believing in things, I doubt all of my experiences and memories, but when I stop trying to make something out of what they are about they are still there. By the way there are other theories of memory, there is not only one theory. I am not an emo person by the way. Usually I am lonely even though I could have many people in my life but having a lot of friends does not help me to feel like I fit in. It would just be harder to make sure people didn't become obsessed with me, I never know why people do that but they do sometimes. Thank you for your opinions. I respect them. By the way, saying someone is anti-social is the wrong word for being unsocial. Anti-social is a criminal behavior and means someone is destructive in society. Since you like being technical. I wasn't being technical, just passing along my opinion which is what this forum is for. Either way, I believe everyone got my point. In this lifetime I am Human and I have no problem with it. Sometimes it feels easier. But I always find it interesting to look more into myself.What I personally view as part of someone's Soul is what that Soul was in their past lifetimes.It could be a different body of a Human,Otherkin,Were,Vampire or any other kind of Being. What I know about myself is that I was another Being in one of my past lives (what I could unlock and interpret so far) and probably many others. Human is also a part of me and I wouldn't change it even though sometimes I forget because I am so concentrated on knowing more. I just like to embrace the other sides of my Soul. Daniel, I mean you no offence but I don't get something.... First, on this thread you said you "do not feel ashamed of being human" and "By awakening",you"meant a natural human type awakening" yet later on this same thread you said that you "only began to come to the realization" yourself "a couple years ago" and then you "knew" that you were a Vampire. Elendor wrote: Tell us what you believe to be the nature of your inner Soul, without fears of being judged or criticized. I am sure that many come here with the purpose of finding themselves, uncovering the secrets that are hidden within their souls and nature. So feel free to express your opinions and intuition on this poll. But the closest I get , I guess . is the word : Feminine. That's a rather broad definition I would say... and also one that would apply to millions. Its the closest I get to describing my essence ..... of energy.... I am many. I have know idea of what other way to put it. verboten wrote: Daniel, I mean you no offence but I don't get something.... First, on this thread you said you "do not feel ashamed of being human" and "By awakening",you"meant a natural human type awakening" yet later on this same thread you said that you "only began to come to the realization" yourself "a couple years ago" and then you "knew" that you were a Vampire. You didn't. I've been at this forum for some time, and over time I have changed in the way I think and feel about everything. Please do not take my posts too seriously. Most of them are from a very volatile time in my ability to think about things. I also voted number one. Why deny? I do not know what the nature of my soul is as I believe this is something that is shrowded in mystery. I do however know that the Vampire Archetype resonates with me. I know that I discovered the ability to use energy, astral project, shapeshift, create and send out shapes, as well as vampirically extract energy from others...however it wasn't so much as a "learning" or even "cultivating" but rather discovering what is already there. My quest into metaphysics was to find out why these things were happening to me as well as gather methods for Mastering them. I have found various forms of meditation, occult exercises, and energy work to be most useful. I do believe that these things are necessary in order to fullfill ones potential as a metaphysical entity. I strongly disagree with Michelle Belanger's idea that Vampirism is rooted in "missing chakras" or "damaged auras". Rather, I believe that the transformation from a human to a superhuman (or Vampire) is due to some type of Initiatory event. This event could be a near death experience or it could be a kind of Initiation where a Vampire Elder "turns" a normal human into a Vampire through sorcerous rites that cause a death of a lesser self so that it can ascend into a higher Vampiric Self. Their are literary descriptions of such things, particularly in Interview with the Vampire as well as Dracula. When I approach the subject of Vampirism, I do so from the perspect of a scholar. It appears to me that the Vampire Archetype has very strong Slavic and Germanic roots, particularly in the light of the fact that the word Vampire is Slavic and that this figure was shaped by Romantic / Gothic writers in the Northern European regions...Bram Stoker and Lord George Byron being good examples of this. The appeal to semitic and kemitic roots appear to be rather recent and is not found in early Vampire fiction. Of course that doesn't mean that the Vampire Archetype does not find correspondance in Qlippothic (The Kain Theory) and Sethian (The Seth Theory) metaphysics...it certainly does. I personally believe that the dark aspects of Slavic and Germanic Mythology does more to illuminate the Vampire Archetype (as described in Western literature...both folkloric and fictional accounts) than Qlippothic and Sethian teachings simply because it is of Western and not Middle Eastern origin. Two particular Gods seem to stand out, the Slavic Serpent-God named Volos and the Germanic God of Death, War, and Magick who goes by the name of Wodan. There was even a Germanic tribe called the Goths who worshipped Wodan who in turn is strongly associated with blood, seduction, magic, death, darkness, serpents, ravens, and wolves. For an example, their were two groups of Gods in the Germanic Pantheon who mixed blood as a truce and placed it in a Cauldron. This sacred blood was eventually stolen by the Giantish forces in which Woden took the name Bolverker (Worker of Evil) and transformed into a Serpent in which he seduced a Giantess and stole this sacred blood-mead and brought it back to the Gods and Mankind. In fact, it is said that Wodan eats nothing but only drinks this blood-mead. This isn't at all suprising considering that the fictional Dracula has much in common with Wodan, particulary in his association with wolves, blood. magic, war, and death. It is hoped that this gives some insight into the nature of my soul and what I think may be the roots of Vampirism. Of course, I am also hoping that I do not seem dismissive of those who are attracted to Vampirism yet find more inspiration in Qlippothic / Sethian teachings. I respect these teachings and consider them highly sound forms of metaphysics that lead to knowledge and power. My intention is to only offer a wider perspective as well as other possibilities for the origin of the Vampire. Have you read the poetic book of Edda , the old one and the new one ?? I have read both the Elder and Younger Edda. 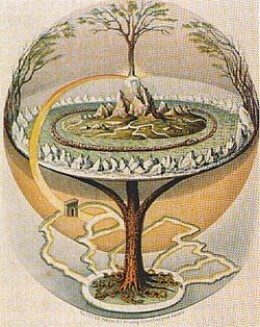 My favorite lay in the Elder Edda is the Voluspa where Odhinn (or Wodan) summons a Seeress through necromantic rites to ask her questions concerning the events that have and inevitably will take place in the cosmos...it is a fascinating tract concerning the Life, Death, and Rebirth of the cosmos. I find the Havimal to also be of great use, particularly how it gives advice concerning manners, chivalry, moderation, and the kind of common decency that is quite rare in our world. The section regarding Wodans ascent into Hel to win the Runes (=Mysteries) is fascinating as well as the description of the 18 Magical Songs. The Catalogue of Dwarves is also of great interest because in the Elder Lore they do in fact have vampiric qaulities, in fact one of the races of dwarves is "Modsognir" which means "motivation sucker" and many of the names are translated to names such as "Death", "Corpse", "Hel Blue" and are described as having very pale skin and black hair. Originally, they were not short and stocky beings (this came much later) but were of regular human size, had the ability to shapeshift (usually into cats or wolves), and were associated with sorcery as well as craftsmanship. Also, the term "dark elf" was actually interchangable with dwarf or ON:dvergr. Their was even a type of magic called seith which was literally a vampiric magic, particularly in how it involves shapeshifting, illusion, causing death & illness, dream haunting, as well as stealing ones energetic essense (ON:hamingja). In any event, setting all of this aside there seems to be alot of wisdom in this forum and it is a pleasure to meet you all. Hopefully I am not coming across as being too pedantic (bad habbit of mine)!